Today I worked on a special order for a client in Wisconsin. 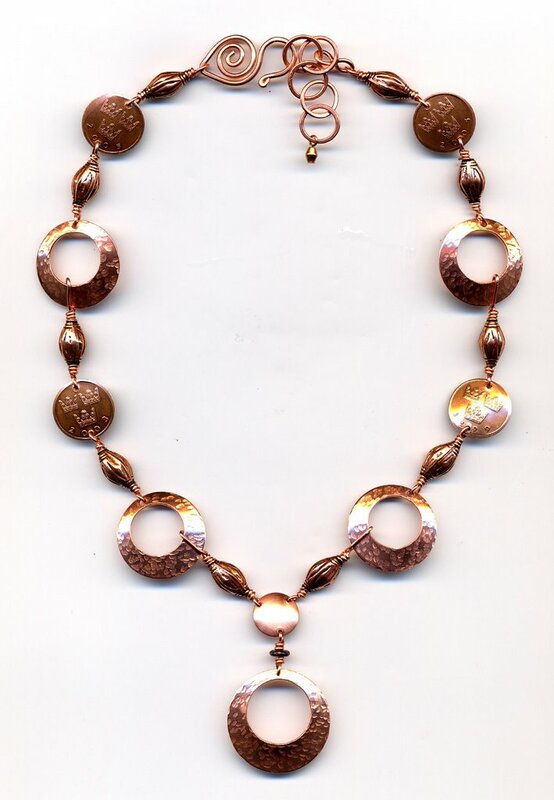 She likes the look of Silpada, but doesn’t trust their quality so she contacted me and gingerly asked if I would make her some Silpada-esque pieces. 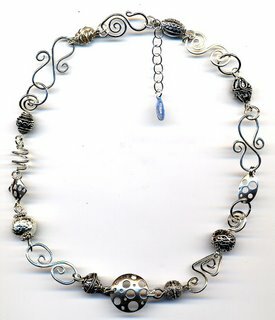 So we paged through the catalog for inspiration and she designed, among other things, this necklace. I cut the pendant out of hammered sheet, filed the edges, then decided it was too plain. So I soldered on (yes, Cheryl) a wire border and quite like the results. 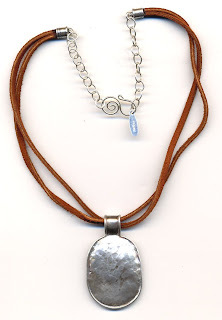 The necklace is suede and the pendants are interchangable (clients’s idea and I think it’s a good one). I also did some hammered & domed earrings, forgot to eat lunch, and WHERE DID THE REST OF MY DAY GO? Perhaps fiddling around with the torch, which I hadn’t touched since we moved to Virginia. I’m noticing that I pick up on British turn of phrase (including “quite”) when reading Brit chick lit. This weekend I read Marian Keyes’ Anybody Out There? Irish girl (the sister of the girl in Watermelon) meets Boston boy (Bah-ston – and all his dialogue just like that – pahk the cah). I liked it because it doesn’t have a Hollywood ending. I met a lady who makes handbags and she requested that I make her a mosaic purse penant. It was a cute idea and I like how it turned out, so I thought I’d share a picture with you, Internet. Check out Marleen’s website for unique, handcrafted purses. 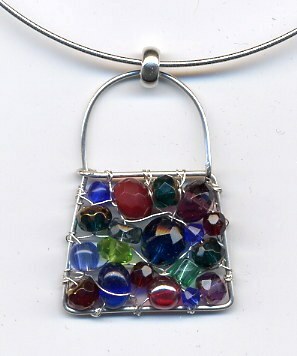 Part of the challenge of what I do is making custom pieces. I try to fill the customer’s wishes while keeping it my own style. This one was somewhat of a departure for me, working all in copper and trying to match a particular pair of earrings. Surprises are tough because then I don’t get to ask the recipient what she would like. This one was tough to get excited about, but now that it’s finished I love it, especially the (gently domed) Swedish pennies. Other special orders are right down my alley. For this piece my customer saw my wire link and lampwork bracelets and asked if I could do a necklace in the same style, but all in silver so she could wear it with anything. Why hadn’t I ever thought of that?! I couldn’t make this one fast enough; couldn’t wait to see the finished product.